The ICT 2018 Conference on 4-6 December in Vienna is Europe’s largest ICT event, with a dedicated exhibition and special events on the digital transformation of society and industry. 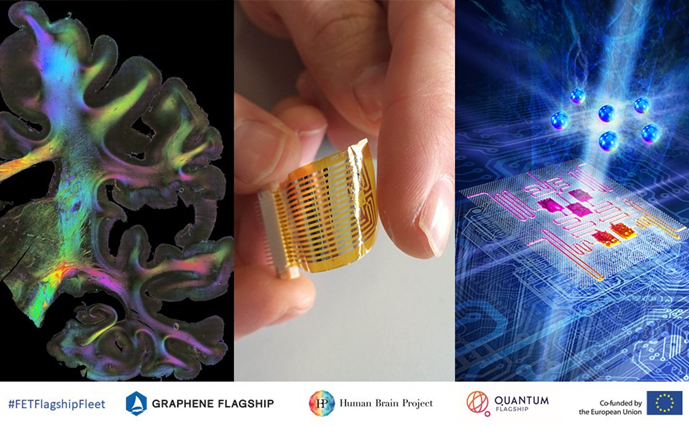 For the first time, all three of the EU’s FET Flagships – Graphene Flagship, Human Brain Project and Quantum Flagship – will be featured in the same place at once. Several media events and three neighboring exhibition booths with interactive demos invite to discover Europe’s Flagship Fleet. The Meet the Flagships event will be held at on 4 December11 am in the ICT2018 Media Centre, presenting an opportunity for reporters to speak with leading scientists from the Flagships. DG CNECT European Commissioner Mariya Gabriel meets with female scientists from the Flagships at the Flagship Women's breakfast event, on 6 December at 8.30 am. Media is invited to attend. On all three days, the Flagship’s exhibition booths in Hall X4 highlight recent advances in the fields of graphene and related materials, neuroscience, medicine and computing, and quantum technologies. Find detailed descriptions and information on the exhibits and available experts below. Graphene Flagship (booth C04) - The Graphene Flagship booth at ICT 2018 will tell the story of graphene and its potential in our lives. Visitors can first of all experience how the graphene story started and learn about the fundamental properties of graphene. From here visitors can see how the story of graphene has moved forward and learn about some of the companies now producing graphene on a large scale. Finally, visitors can experience the potential of graphene in such exciting application areas as flexible displays, circuits and NFC devices, wearable sensors printed on textiles, pressure sensing, aeronautics, biomedical applications and photodetectors. Human Brain Project (booth C10): The exhibition booth of the Human Brain Project has five stands with several hands-on exhibits. Visitors can use a high-precision method from neuroscience to look inside the intricate “wiring” of the brain, and zoom through a virtual counterpart, the HBP’s highly detailed multilevel 3D brain atlas. Also on display are scaled down versions of the brain-inspired BrainScales and SpiNNaker neuromorphic computing systems, and neurorobots that visitors can interact with. Presentations showcase the HBP’s ICT-Infrastructure for brain science and new successful technology-driven medical approaches to epilepsy and paralysis. Sacha Van Albada, who links simulations to cognitive models of vision and movement and ran the largest brain simulation to date on a neuromorphic chip. Timo Dickscheid, Implementation leader HBP Human Brain Atlas (Thursday Only). The Quantum Flagship (Booth C05) will showcase different aspects of quantum technologies, from research to innovation, along the example of quantum communication. Visitors will be able to experiment with quantum fundamentals with a science kit, visit a quantum optics laboratory and even visualize the quantum properties of a laser setup virtually. To help visitors put these discoveries in terms of applications, there will be a demonstrator of data protection and a random number generator prototype to talk about the use of QTs in communications and data security (cybersecurity). Scientists from academia and industry such as the technical University of Kaiserslautern, QUSIDE, ID Quantique, qutools or the National Institute for Nuclear Physics, will be present to explain their demonstrations and explain the potential that quantum technologies pose to society. The representative of the Quantum Flagship at Tuesday's Meet the Press event is Thierry Debuisschert Chair of the Science and Engineering Board (SEB) of the flagship.